All Web addresses mentioned were functional as of 6-17-16. From the Cumberland Gap to the Atlantic Ocean, this is Virginia Water Radio for the week of June 20, 2016. This week, we feature a Blacksburg- and Roanoke-based band with a song that doesn’t have a thing to do with water...or does it? Have a listen for about 40 seconds. You’ve been listening to part of “I’m a Hog for You Baby,” performed by No Strings Attached, on their 2003 CD, “Old Friend’s Waltz,” from Enessay Music. This song—written in the 1950s by Rock & Roll Hall of Fame songwriters Jerry Leiber and Mike Stoller—is about a two-legged, love-hungry “hog.” But the lyrics convey a fitting image of invasive species, the hogs of all kinds that affect waters and lands worldwide—from London to Hong Kong to right here in Virginia. Invasive species are non-native organisms whose introduction into an area eventually damages the environment, human health, or the economy—the latter on the order of about $120 billion nationwide each year. Many non-native organisms don’t cause such problems, but the invasive ones are able to reproduce so successfully that they outcompete native species for resources, excessively feed on native species, spread new diseases, or alter natural habitats. Some invasive species actually are hogs—wild, or feral, hogs are increasing in numbers and impacts in Virginia and other states. But other invaders are plants, insects, microbes, fish—you name it. For example, species mentioned in Virginia’s 2012 “Invasive Species Management Plan” include Phragmites, a wetland grass; Emerald Ash Borer, an insect; Zebra Mussel; Rusty Crayfish; Blue Catfish; and Nutria, a rodent. 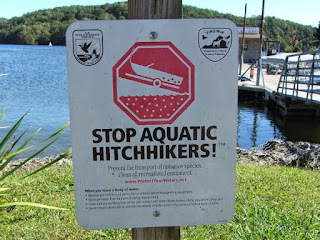 Citizens can help in several ways to reduce invasive species’ spread and impacts; among the most important ways are cleaning boats and other water gear; using only local firewood; avoiding invasive landscape plants; and not releasing fishing bait, aquarium fish, or aquatic plants to waterways. Thanks to guest host Kriddie Whitmore for lending her voice to this episode. For more Virginia water sounds, music, and information, visit us online at virginiawaterradio.org, or call us at (540) 231-5463. Virginia Water Radio is produced by the Virginia Water Resources Research Center, part of Virginia Tech’s College of Natural Resources and Environment. Thanks to Stewart Scales for his banjo version of "Cripple Creek" to open and close the show. In Blacksburg, I’m Alan Raflo, thanking you for listening, and wishing you health, wisdom, and good water. Thanks to Virginia Tech graduate student Kriddie Whitmore for being a guest host for this episode. “Old Friend’s Waltz,” containing “I’m a Hog for You Baby,” is copyright by No Strings Attached and Enessay Music, used with permission. More information about No Strings Attached is available from their Web site, http://enessay.com/. “I’m a Hog for You Baby” was written by Jerry Leiber (1933-2011) and Mike Stoller (born 1933), and first released by The Coasters in 1959. More information about the renowned songwriters Leiber and Stoller is available from the Rock & Roll Hall of Fame Web site, “Jerry Leiber and Mike Stoller Biography,” online at https://rockhall.com/inductees/jerry-leiber-and-mike-stoller/bio/. A list of recording artists who have recorded “I’m a Hog for You Baby” and other Leiber and Stoller songs is available at Leiber and Stoller.com, “Discography,” online at http://www.leiberstoller.com/Discography.html. This episode is a revised version of Episode 218, 6-16-14, which has been archived. 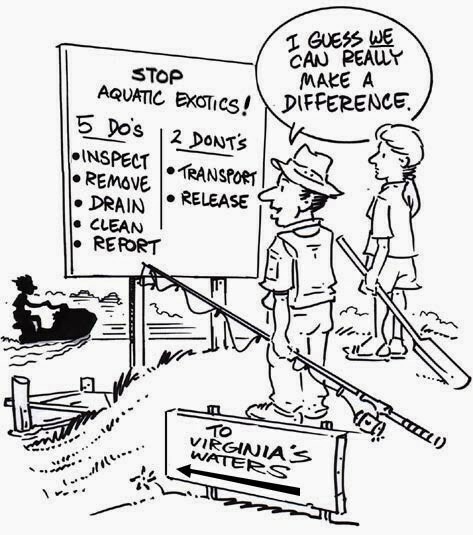 Poster by the Virginia Invasive Species Council, accessed online at http://www.dcr.virginia.gov/natural-heritage/vaisc/, 6/17/16. 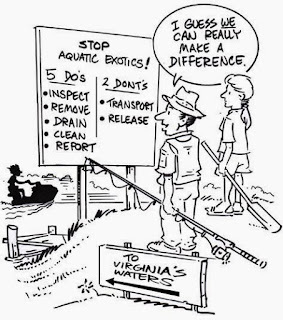 Cartoon by George Wills of Blacksburg, Va. (http://www.etsy.com/people/BlacksburgArt), originally published in “When Aquatic Visitors Become Unwelcome Residents,” Virginia Water Central Newsletter, Aug.-Sept. 2011 (pp. 7-20), online at https://vtechworks.lib.vt.edu/handle/10919/49323. 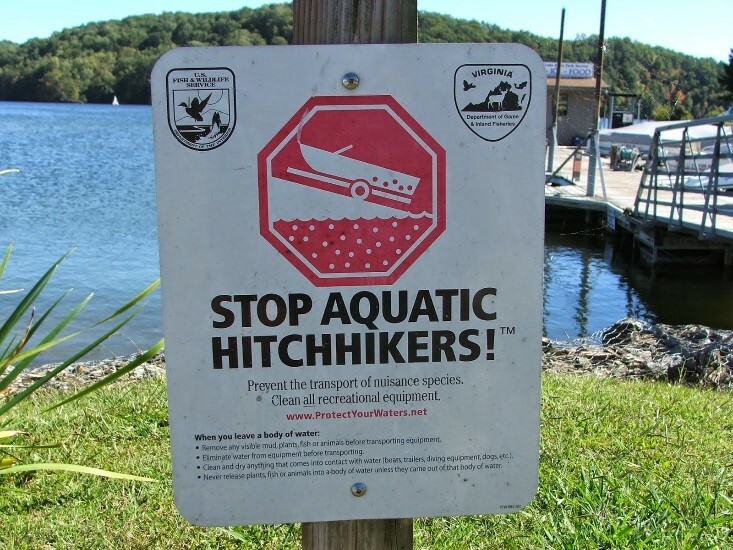 Sign alerting boaters to the potential for spreading aquatic invasive species from one water body to another if boats and other water gear are not cleaned after use. At Claytor Lake State Park, Pulaski County, Va., September 23, 2012. According to the Aquatic Nuisance Species Task Force, “Over the past 200 years, more than 50,000 non-native plant and animal species have become established in the United States. Approximately one in seven has become invasive, with damage and control costs estimated at more than $120 billion per year - a cost higher than the total of all other natural disasters combined” (from page 7 or “Aquatic Nuisance Task Force Strategic Plan for 2013-2017,” online at http://www.anstaskforce.gov/default.php. The citation for the $120 billion figure is “Update on the environmental and economic costs associated with alien-invasive species in the United States,” by D. Pimentel, R. Zuniga, and D. Morrison, published in 2005 in Ecological Economics, Vol. 52, pp. 273–288. Aquatic Nuisance Species Task Force, online at http://www.anstaskforce.gov/default.php. This is a collaboration among 13 federal agencies, coordinated by the U.S. Fish and Wildlife Service and the National Oceanic and Atmospheric Administration (NOAA). The Aquatic Nuisance Task Force Strategic Plan for 2013-2017 is available online (as a PDF) at http://www.anstaskforce.gov/Documents/ANSTF%20Strategic%20Plan%202013-2017.pdf. Jennifer Gagnon, Virginia Tech Department of Forest Resources and Environmental Conservation, Virginia Forest Landowner Education Program, “Exotic Invasives” article series, online at http://forestupdate.frec.vt.edu/resources/publications/index.html. Scott Klopfer, “Nutria-sighting Website Allows Public to Help Control Spread of Invasive Rodent,” Virginia Tech College of Natural Resources and Environment “Engagement Matters” newsletter, May 2013; as republished with permission on the Virginia Water Central News Grouper Web site, 5/16/13. 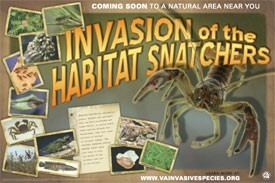 National Invasive Species Council, online at http://www.invasivespecies.gov/. According to its Web site, this group includes the Secretaries and Administrators of 13 federal departments and agencies, who seek to provide high-level coordination on invasive species; it’s co-chaired by the secretaries of the departments of Agriculture, Commerce, and Interior. Virginia Department of Conservation and Recreation/Natural Heritage Division, “Invasive Alien Plant Species in Virginia,” online at http://www.dcr.virginia.gov/natural_heritage/invsppdflist.shtml. Virginia Department of Game and Inland Fisheries, “Feral Hogs,” online at http://www.dgif.virginia.gov/wildlife/feral-hogs/. “War of the Worlds—Trying to Win the Battle Against Invasive Species,” by Bryan Watson, August 2007. Virginia Invasive Species Working Group, “Invasive Species in Virginia,” online at http://www.dcr.virginia.gov/natural_heritage/vaisc/. The Virginia Invasive Species Management Plan, approved by the group in August 2012, is available at this Web site. South Carolina Sea Grant Consortium, “Red Lionfish—A ‘Super Invader’ for Supper?” Coastal Heritage, Vol. 27, No. 4 (Fall 2013); available online at http://www.scseagrant.org/Sections/?cid=82, or contact the S.C. Sea Grant Consortium at (843) 953-2078. Virginia Department of Game and Inland Fisheries, “Fish and Wildlife Information Service,” online at http://vafwis.org/fwis/?Title=VaFWIS+Species+Information+By+Name&vUT=Visitor. This site allows you to search for particular species and determine whether they are native or non-native to Virginia and to access much other information on species habitat, distribution, and ecology. Virginia Native Plant Society, list of Web sites for non-native and native plants in Virginia, online at http://vnps.org/conservation/invasives/webreferences/. All Water Radio episodes are listed by category at the Index link above (http://www.virginiawaterradio.org/p/index.html). See particularly the "Science" topic category. No episodes prior to this one have dealt specifically with invasive species.